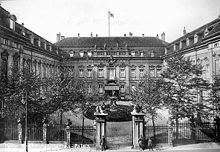 The Presidential Palace ( Reichspräsidentenpalais) at the Wilhelmstrasse in Berlin. The Reichstag, 12 September 1932: Chancellor Franz von Papen (standing left) who wants to declare the dismission, above at the right the Reichstag president Hermann Göring ( NSDAP) who looks the other way. 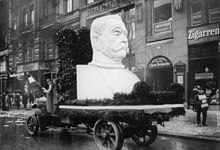 This page is based on the Wikipedia article President of Germany (1919–1945); it is used under the Creative Commons Attribution-ShareAlike 3.0 Unported License (CC-BY-SA). You may redistribute it, verbatim or modified, providing that you comply with the terms of the CC-BY-SA.